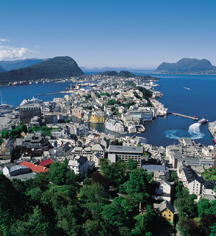 Ditributed throughout several islands, Ålesund is a colorful Art Nouveau town in the heart of the frothing sea. 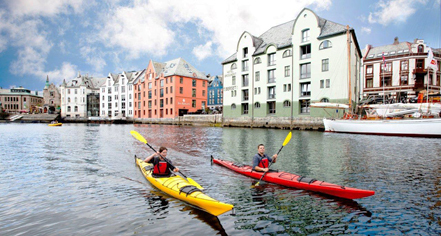 Geirangerfjord, Ålesund and the Sunnmøre area offer exciting activities that can be enjoyed on foot, bicycle, car, or boat. Hotel Brosundet makes an idyllic stay to experience the unrivaled offerings of Ålesund and its surrounding nature first-hand. Known as "cathedrals of the coast" in Norway, lighthouses are structures that assist in the safe passage of ships along the often dangerous coasts. Fresh air, snow-tipped peaks, and the lively nature of the North Sea provide a stunning backdrop for a cruise exploring the historically significant lighthouses and their cultural impact of Norway. As one of the most well-known peaks of the Sunnmøre Alps, Slogen has magnificent views along its cliff side trails. Unfolding during the ascent up the 1564 meter peak, soaring panoramas of the village of Øye and Norangsfjord offer a unique experience for any hiker.